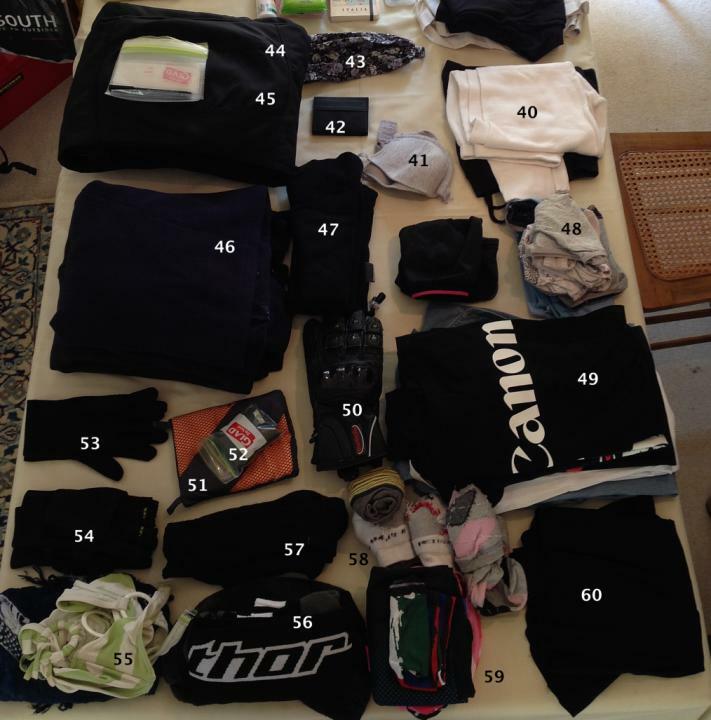 What do women pack for Motorcycle Adventure travel? 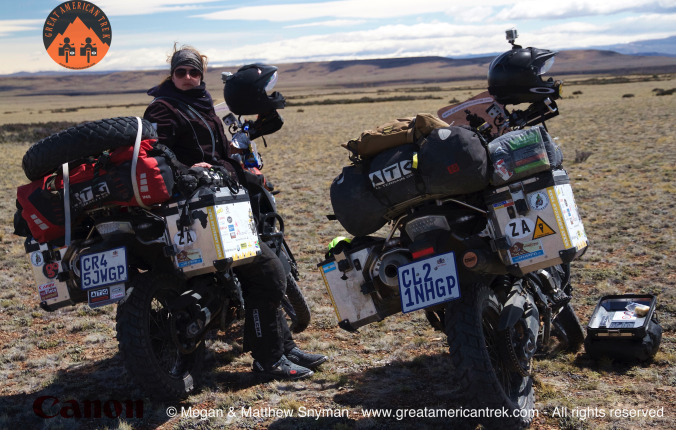 How do you pack for an extended overland motorcycle trip as a woman? We all know that guys are willing to turn their undies inside out – repeatedly-, and will wear a shirt till it is basically paint-stripper in order to keep packing light, but I don’t think many women are willing to go that far. I LOVE traveling, but I also usually never pluck my own eyebrows (it always goes badly wrong), I go for regular waxes, love to get facials, and I cover my ever expanding range of grey hairs (I blame my husband and trip-planning) with hair-dye at the local Hyde Park Salon. My first overseas trip at the age of 16 saw me take a suitcase for 14 days travel that I couldn’t pick up myself… Despite the above, however, I am not a girly-girl and think I can easily adapt to travel without the above luxuries. 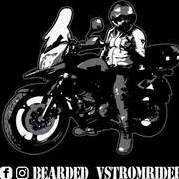 Here is what I packed for our 12 month plus overland trip on two BMW F800 GS motorcycles, never having attempted a trip like this before. 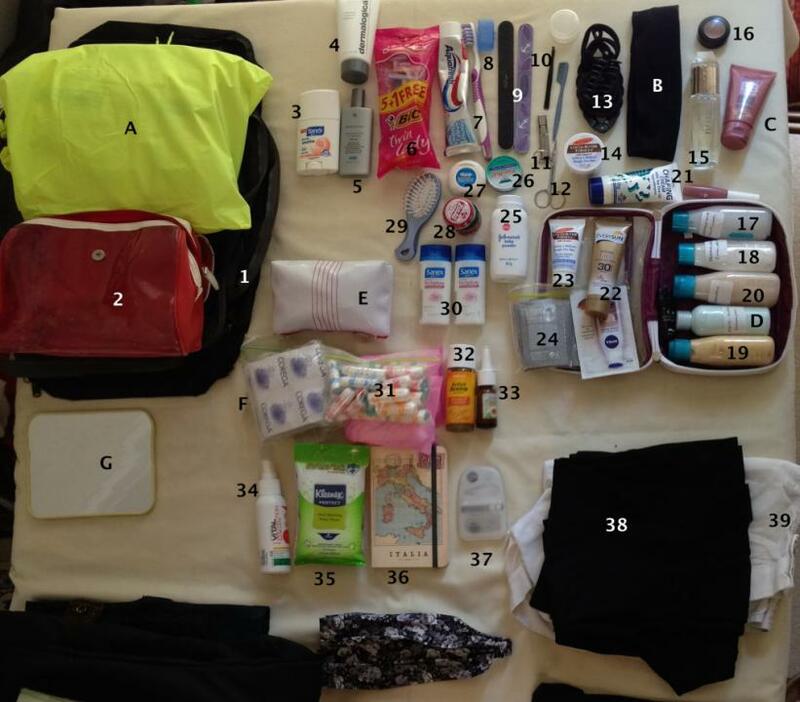 The list does not include our shared medical kit, camping gear, kitchen or toolkit and is only my gear: what has worked and what hasn’t after 4 months of travel. I am sure in another 4 months it may look very different, and I will do another post closer to the end of our adventure. 3 garment mesh bags of various sizes, made by Sea to Summit, and sold by Adventure Inc: Matthew initially teased me about these, but they have also proven to be one of the best things we bought and take up no space. You can use separate bags for pants, tops, underwear or a combination, and they greatly simplify your daily packing and unpacking. They have also become extremely useful as camp pillows: They are both soft and the perfect size and thickness. Toiletry Bag: Cause we all know that when your toothpaste leaks you don’t want it between your clothes. Deodorant: I picked the non-spray version as it lasts longer. Dermalogica Face Cream: This is good cream that I had at home and wanted to use for as long as possible on the trip. No plans to replace it when it runs out, but so far it has lasted me 4 months. You have to take care of your skin, especially your face. SPF 50 Suncream for your face, supplied kindly by the Fourways Aesthetic Center: The sun is strong and sun-damage is not reversible. This small tube has protected my face every day for over 4 months and is still going, where in South America the UVA exposure is often above 13 (extreme). I haven’t burnt once. Disposable razors: Because waxing is not a viable option. Toothbrush cap: Matthew teased me for this too but it has proven to be more than useful and takes up no space. Great not to rest your toothbrush on a gross hostel basin, and you can put a wet toothbrush back among your things. Nail file: Because nothing is more annoying than a nail that hooks on gloves, hair and clothes. Small scissors: Multitude of uses from cutting open packages, bandages, trimming beard hair (not mine) and eyebrows. Perfume: small bottle of perfume that I admittedly rarely use, but I love that occasionally I can smell great, and I can’t part with it. Dermalogica Face wash: Left over from home supply now finished and the bottle has been recycled for pepper in the kitchen. Another small tube of cream for a pocket or tankbag: I took a few small ones, rather than one big one, but have recently decided to rather carry a big one we share and leave the small ones. Baby powder: This is a saviour for chaff and days when you cannot shower. Floss: always essential for your teeth, for sewing clothes or for emergency stitches. The smallest hairbrush I could find: If you think this is a luxury you have never ridden a motorcycle with long hair – birds-nest comes to mind. Two small body washes – one for Matthew and one for me. Now we just share from one bottle. Assorted Tampons and pads: These are personal preference, and I have had no problems replacing both in South America. Remember that in Africa in the rural areas you will rarely find tampons, and that their use is also dependent on your own hygiene. Please carry a small plastic packet for their disposal – you do great damage by leaving these in nature. Flixonase nasal spray: actually for medical but I carry this with me to ward off regular hayfever attacks. Mosquito repellent: Citronella repels mosquitoes but not strongly and especially little in the open air, so if you travel to areas with Malaria, Dengue or many bugs get something with the active ingredient such as permethrin. We bought this Vital Protection at the local pharmacy for R120 (±$11). It even repels spiders (tested myself, not advertised)- vital for me. They also have spray for textiles and even a wash for clothes, where it lasts for 3 months! Wet-Wipes: moistened towels that serve in place of a bath or shower and many other uses. Travel book: This small book is where I keep our insurance details, the contact details for important people and all the details for the people we meet on the road. Travel sewing kit: I have used this kit more than I would have liked, and just added some larger needles and thicker thread. Pair of tights: I have often worn these, including under my motorcycle pants in the cold. They are now too big for me and riddled with holes. I will be replacing them soon. Pair of shorts: I didn’t end up taking this pair (they are white) but bought a pair on the road when the temperature went up. Thermal underwear: These were not the best and after freezing in southern Argentina, I threw them out and invested in a decent pair of thermals that are also smaller and lighter. Don’t cut corners on thermals if you will be riding in the cold. Two bra’s and one sports Bra- I save the sports bra for off-road riding. Fleece top: I took a fleece I bought in RSA on a cold ride in Dullstroom. I love it and it is great under the riding jacket – please note my jacket does not have a warm layer. Pair of Kevlar jeans from X-Kulcha: These have served me well and double as jeans for around town. They have made a range and these “skinny” jeans fit well and are strong, they also don’t look like riding jeans. 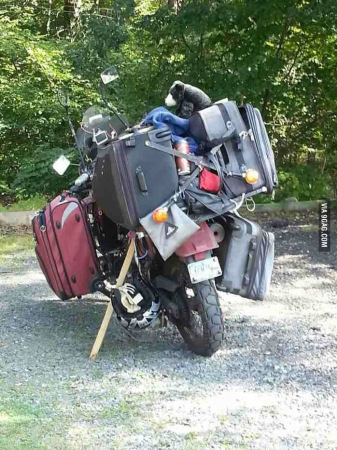 Pacsafe: This is usually a backpackers item, but has become a bike-lock on our trip. It is long enough to lock our two BMW’s together and we do so every night, even behind locked gates. Underwear: I have taken 2 pairs of recommended Bamboo underwear that reduce chaff, don’t migrate and last long. I am not disappointed. I did however add a few pairs of cotton underwear and the total is 6 pairs. Tops: 1 x longsleeve top, 1 x spaghetti strapped white top, two vests, two t-shirts, 1x black long fitted top and 1x shirt. These cover for a range of climates, however white is a bad idea as I cannot keep it white. The black long fitted top has been my best so far. 1x pair of leather motorcycle gloves from X-Kulcha: I wear these every day, and though not waterproof, they have proven both comfortable, hardy and surprisingly windproof. I am really impressed by these gloves and will buy them again. 1x microfiber towel: These are great space savers but I have lost mine and now use a facecloth. I have one complaint and that is that after a certain period of use these microfiber towels develop an odour that no amount of sun-exposure or soaking can erase. Glove inners: one set of warm glove inners are vital for the cold. 1 x set of gloves for off the bike. These are fingerless gloves that double as mittens from K-way South Africa and are the best I have ever owned. Assorted socks: to wear on hikes and around town. I have 4 pairs. Assorted Buffs: I have taken 4 buffs and one windproof buff from Adventure Inc. with me. Their uses range from keeping the hair out of your face, to keeping bugs and wind off your neck and even as emergency hair elastics, towels and visor cleaners. I also wrap these around my camera in my tank bag to keep the camera cushioned. A: Rain proof outer gear for riding – This set of plain, plastic worker’s waterproof overs were recommended by a number of people. They served well to keep me dry in a few rain-storms and then the plastic wore at the seams and they were no longer waterproof. For shorter trips they may work, but not for extended travel – unless they can be regularly replaced. I also had to cut the bottom of the pants to fit over my riding boots. It has been 2 months and I have not yet managed to replace them, despite visiting every fishing shop in Chile. B: Hairband for when showering and washing face: I have thrown this out as I never use it, and Buffs do the same job. C: BB Cream: I also hardly ever use this, and my skin is finally clearing without the stress of a regular job. I haven’t parted with it yet, but will very soon. It is time. E: Small bag of anti-oxidant treatment for skin regularly exposed to the sun. This was supplied by a friend in large quantity and we have had to cut down, but I am still using these vials in place of face-creams. F: Corega effervescent tablets: These were important for me to pack as I use a bite-plate due to grinding my teeth at night. I have subsequently stopped using the plate, and have thrown these out. G: Small flat mirror: a gift that cracked within the first few days, which we tried very hard not be superstitious about. Not necessary to replace as there are mirrors on the bike – if you really need one. H: Thick warm Hoodie : With much regret I had to get rid of this hoodie. It was too big and heavy, and did not provide enough warmth. I hope a lucky backpacker adopted it. 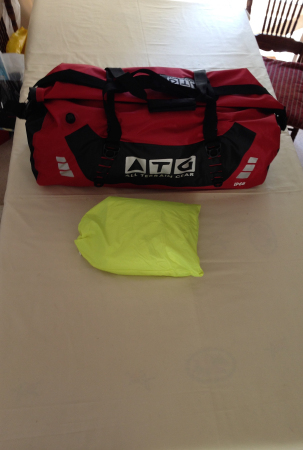 All Terrain Gear Soft luggage 50L (seen below): This awesome bag is waterproof, dustproof, bugproof and hardy. It comes in a variety of bright, high-viz colours and has reflective detail. A strong feature are the large number of D-rings and other areas to tie things to. We leave this bag outside the tent under the rain cover and just close it at night, where it has often stood in water overnight with no problems. Leatt Adventure Jacket: This amazing Jacket fits the Leatt neck brace and is fully waterproof to the top of your neck. I have found it comfortable to wear, well ventilated in the heat and windproof in the cold. It is filled with many pockets and hidden pockets, in both the waterproof and outer layers. It is however lacking a warm layer and I have had major problems with the main zip, a weak point of the jacket, which Leatt is aware of, and promise to rectify in future models. I will definitely use this jacket again in the future. Leatt neck brace: This neck brace has thrice saved Matthew’s neck (once on this trip when he hit a rock in the loose sand at speed in Iquique), and neither of us will ride without one, even down the road to the shops (ATGATT!). The new braces are so low profile that you don’t notice you’re wearing one. X-Kutcha Dakar riding pants: These pants have worn well over months of travel and are very hardy, looking brand new after every wash, so much so that it’s a bit spooky. They have reflective details, dry extremely fast, don’t smell at all and are made from tested Kevlar for protection. However they lack waterproofing, wind-proofing or a warm layer. Hard knee protection also had to be added after market. Earplugs to protect from the noise: we use the MotoSafe range, bought from and recommended by Touratech South Africa and find them comfortable to wear over long distances..
Salomon XA Pro 3D GTX shoes: These versatile, waterproof and durable shoes fit well into my adventure. When I get off the bike these are what I wear from walking around a town to hiking Torres Del Paine. As a doctor these are all I wear on 36 hour shifts too. Highly recommended and there is no equal. Down jacket: I added a down jacket to my kit in Southern Chile after riding in average temperatures below 5 degrees C. I have never regretted it and it stuffs really small into its own stuffsack. Waterproof outer shell: a Thin waterproof jacket to protect the down when off the bike and for walking around town. The windproof aspect also really helps to conserve heat. Aqueous cream: In the very cold and the very hot, it is difficult not to use a moisturiser. This cream works best as it is free of perfumes and other additives and can therefore be used as a face cream too. 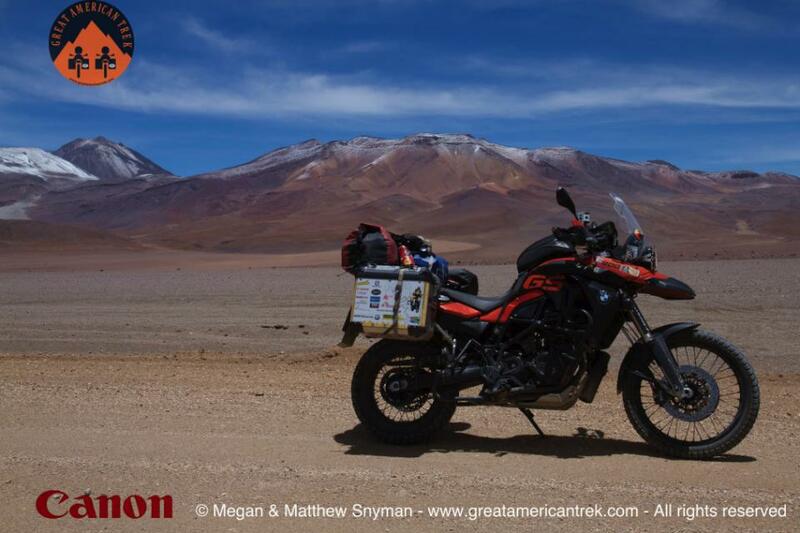 Especially in the cold I struggled with cracked fingertips, a seemingly minor problem until you develop it and you struggle to strap your gear to your bike for the pain. SPF 30 Suncream to use on our bodies and can also double as a moisturiser – though not a good one. Two facecloths to replace my lost microfiber towel. In-ear ear-phones: we bought at duty-free in Chile. If you really get in-ear phones you can hear your music or partner while riding on highways or in gale-force wind, without any discomfort from the helmet. We use them with our Sena Bluetooth kits to chat or listen to music. We never got these before we left and I regretted it everyday till we found some in Chile.